To discuss options for tackling the North’s growing threat, the two leaders confirmed that they will hold trilateral talks with South Korean President Moon Jae-in on the sidelines of the Group of 20 summit, which begins Friday in Germany, Kyodo News quoted Deputy Chief Cabinet Secretary Koichi Hagiuda as saying. Following his call to Abe, Trump also spoke over the phone in a separate conversation with Chinese President Xi Jinping. The leaders of the world’s two largest economies discussed “the growing threat posed by North Korea’s nuclear and ballistic missile programs,” the White House said in a statement. “Both leaders reaffirmed their commitment to a denuclearized Korean Peninsula,” it added. North Korea’s missile and nuclear development programs have been one of the Trump administration’s top foreign policy issues as it seeks to rein in the isolated regime of dictator Kim Jong Un. Pyongyang has conducted a spate of missile and nuclear tests in defiance of U.N. sanctions over the last 18 months, including a barrage in March that the North said was practice for a strike on U.S. military bases in Japan. Experts said the hypothetical target of that drill was U.S. Marine Corps Air Station Iwakuni in Yamaguchi Prefecture. 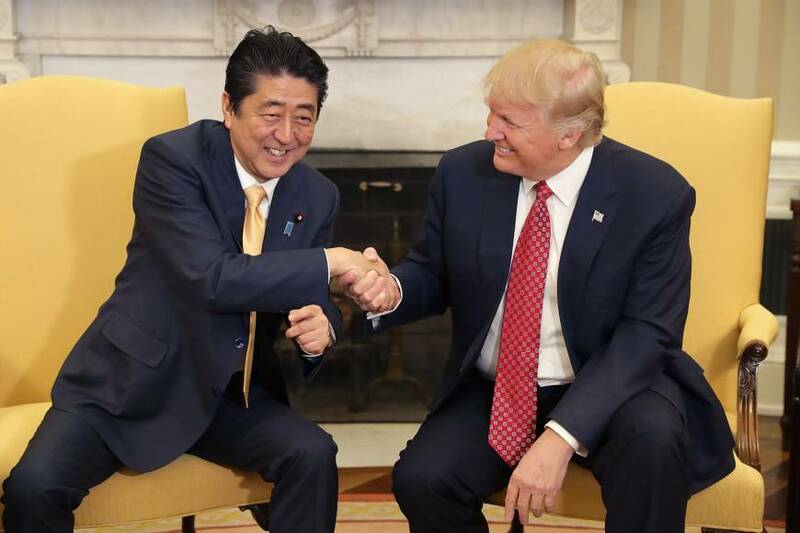 The White House has worked closely with the Abe administration on the North Korea issue, but had until recently pinned its hopes on China, Pyongyang’s sole ally, to use its leverage with its neighbor to pressure the isolated regime. Trump and Xi held a summit in April, where he sought to work with China to ratchet up “maximum pressure” on the country. 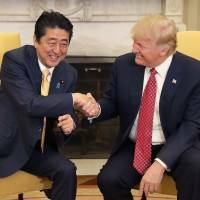 Experts say Trump could in the future urge Japan to play a larger role in reining in the North’s atomic ambitions as Pyongyang works to develop nuclear-tipped missiles that could hit both Japan and the U.S.
“It’s not popular to say, but in its own way, over the past decade Japan — not just the U.S. — has really fallen asleep on North Korea as it became more and more of a threat,” said Van Jackson, a senior lecturer in international relations at Victoria University of Wellington in New Zealand. As a possible acknowledgment of this, recent media reports have said that Tokyo is considering increasing the pace of upgrades to its ballistic missile defense system in cooperation with the U.S., including deploying the land-based Aegis missile defense system known as Aegis Ashore.